Thank you for choosing the NC Aquarium on Roanoke Island! Please scroll through the list below to check out the wide variety of tours and indoor programs offered throughout the year for you and your family. Pre-registration is REQUIRED for each of these activities. 252-475-2314. Messages left with the registrar do not secure your reservation. 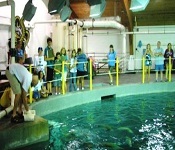 Accompany an Aquarium educator to sneak a peek behind the scenes of different areas in the Aquarium. Visitors will see the exhibits and all the systems that keep them working, from a side normally viewed by staff only. Ages 8 and up- Children under 13 must be accompanied by a paying participating adult. Staff will meet participants at Visitor Services area in the lobby. Closed toe shoes are required. Experience what it is like to work as an Aquarist as you spend a few hours of your day working with our staff behind the scenes. Prepare food for the box turtles, visit and interact with animal ambassadors, and prep food for the largest exhibit in the Aquarium. Once meals are prepared, observe the fish and sharks feast in the 285,000-gallon Graveyard of the Atlantic exhibit. Be prepared to roll up your sleeves and get a little "fishy." Closed toe shoes and a bag lunch are required. Ages: 8 and up. Children under 13 must be accompanied by a paying participating adult. Program begins at 9:00 am. Staff will meet participants at Admission area in front gate entrance. Venture behind the scenes of the Aquarium’s 285,000-gallon Graveyard of the Atlantic exhibit to observe one of the weekly shark feedings. Participants will not be able to assist with the shark feeding, but will get an up close look as all of the fish and sharks feast on favorite food. Ages: 6 and up - Children under 13 must be accompanied by a paying participating adult. Staff will meet participants at Visitor Services area in the lobby. Closed toe shoes are required. Get an exciting start to your day at the Aquarium as you assist our staff with a morning feeding, while learning about a few of the resident species. Participants will feed the stingrays at the touch pool, and then snack on a light breakfast of “people” food. Ages 6 & up- Children under 13 must be accompanied by a paying participating adult. Closed toe shoes required. Program begins at 8:30 am. Staff will meet participants at Admissions area in front gate entrance. Take a short visit behind the 285,000-gallon Graveyard of the Atlantic Exhibit. Peek into the dive locker, learn about an out-of-site holding tank, and get an overhead view of the largest exhibit in the Aquarium. Ages: 6 and up - Children under 13 must be accompanied by a paying participating adult. Staff will meet participants at the Visitor Service area in the lobby. Closed toe shoes are required. Join the Aquarium this spring to learn about one of our local endangered species, the sea turtle. This activity is more than just an egg hunt! Children will take part in a sea turtle program, come face to face with a loggerhead turtle, and make a craft to take home. 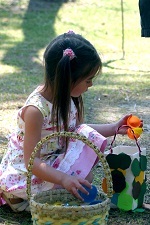 The program will conclude with an egg hunt on the Aquarium grounds as children search for eggs filled with treats! Event will be held rain or shine. Bring your child to take advantage of a fun-filled 45 minute toddler time. Beginning at 11:00 am, each session encourages hands-on learning of a new animal topic or nature theme using stories, crafts, and occasionally free time in the Aquarium. Parents can sit back and relax, as little ones play while accompanied by our education staff. Ages: 2-5. Advanced registration is strongly recommended, will close registration at 10am the day of program if numbers are low. Staff will meet participants at the Visitor Services area in the lobby. No program fee for adults, but regular admission rates apply.